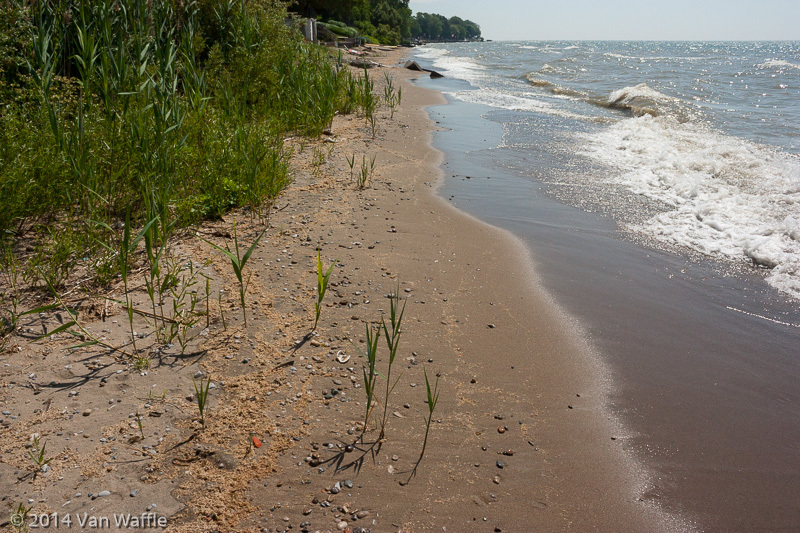 On the weekend I paid a brief visit to the backyard where I grew up, this north shore beach of Lake Erie. A reunion with a few high school friends provided opportunity. My partner and I stayed at a bed and breakfast nearby. My family doesn’t live there now. Friday evening and again Sunday morning we parked the car in the right-of-way beside the property and wandered down to the beach. Growing up beside one of the Great Lakes made a deep, enduring impact on my psyche. I didn’t realize how universal this might be until we met a friend for dinner on Friday evening and he mentioned, in passing, the full moon on the water. This is a powerful, deep-seated image for me. My old house faces due south across the water. On summer nights with a warm breeze in the flashing poplars, the moon swings low, spreading a wide, silver path across the shushing waves. Many times my mind has taken that road to a hypnotic state. It is sensual, stimulating, refreshing and all-absorbing. I would fall asleep on breezy nights with the distant rhythm of waves in my ears. He nodded introspectively. That’s why he lives there still, he said. Commuting to the city is worth the trouble for him. Days can be equally delicious, although Lake Erie’s warm, shallow waters give off a stupefying humidity, sometimes unbearable. This is the sun parlour and thunderstorm capital of Canada. It didn’t slow us down as kids, as you can read in my story about adventures with nettles in Edible Toronto. The lake has been notorious for pollution, especially in the ’60s and ’70s. This part of the north shore was somewhat spared. Later, international cooperation between Canada and the United States improved water quality. Because it is so shallow, Erie deteriorated worse than other Great Lakes, and rebounded faster. The unfortunate introduction of exotic zebra mussels, filter feeders, added a natural cleaning effect in the ’80s but presented a hazard with their razor-sharp shells. In any case, we always swam there without consequence. I have spent hundreds of carefree afternoons with relatives and friends playing, walking and dreaming on this sand. My heart was breaking last time I said goodbye to this place, when my father sold the house. This time I didn’t feel that way. My life has moved on in various ways: I look forward more than back. That doesn’t dissolve the powerful connection I will always feel with Lake Erie, but I can take each sun- or moon-drenched visit as a gift.